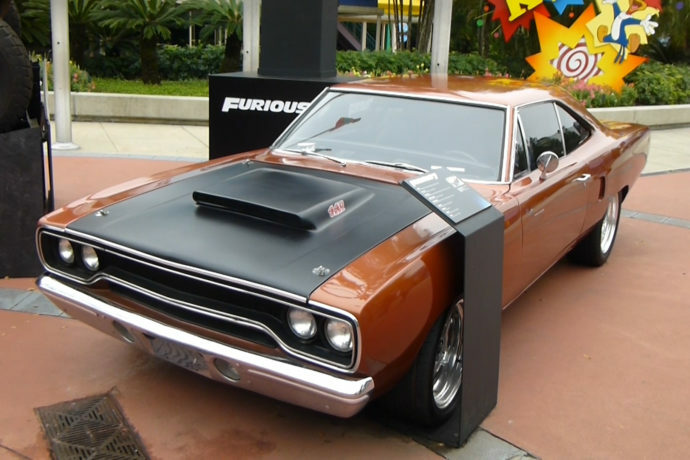 Screen-used cars from the new Fast & Furious film are now on display at Universal Studios Florida. Get up close and take a picture with three cars from the new film. You’ll find these Furious 7 automobiles on display at the entrance to KidZone, in front of the Animal Actors stadium. These vehicles were driven by Vin Diesel, Michelle Rodriguez, and Jason Statham in the seventh installment of Universal’s Fast and the Furious franchise, which hits theaters on Friday, April 3rd. Universal has displayed other vehicles from the Fast & Furious films in the past so it’s not too surprising that they’re doing it again. It’s always pretty cool to see something that was used in a film in person. Check out the video, and the screenshots below as well, for more details about the cars.